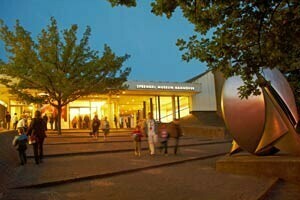 World-class art is on show at the Sprengel Museum, which opened in 1979 in Lower Saxony's regional capital Hannover. It ranks as one of the major museums of 20th and 21st century art, with German Expressionism and French modernism particularly well represented. Additions to its collection in recent decades reflect the key movements in modern art – from Kurt Schwitters to Niki de Saint Phalle. The museum's foundation dates back to a gift from Margit and Bernhard Sprengel, who donated their extensive modern art collection to the city of Hannover in 1969. Hannover's existing 20th century art collections were also moved to the new Museum of Modern Art building, which was renamed Sprengel Museum Hannover in 1984. Comprehensive collections of the works of artists such as Paul Klee, Emil Nolde and Max Beckmann, and the Brücke and Blue Rider schools are featured. In the year 2000 one of the 20th century's most influential artists Niki de Saint Phalle donated to the museum more than 400 works representing all the major phases of her creative career.